Converse manufactures its products under the Cons, Chuck Taylor All-Star, John Varvatos, and Jack Purcell trade names. In addition to apparel and footwear, the company sells other items globally through retailers in over 160 countries and through approximately 75 company-owned retail stores across the United States, and employed 2,658 in the U.S. in 2015. To this day, this spirit continues with all of our sneakers and apparel for All Star, Cons and Jack Purcell. As soon as you put them on and start doing your thing, their true life begins. You define them. You determine their journey. They become a one-of-a-kind celebration of your individuality and self-expression. They become a part of you. They’re Made by you. Converse’s Chuck Taylor sneakers have been around since the early 20th century, but they haven’t changed much—until recently. In 2015, The Chuck II—a new line of Converse that looks much the same as the original shoe but with a little more padding and arch support—hit stores. In honor of the kicks’ staying power, here are 11 facts about Converse Chuck Taylor All-Stars. Converse enters its second century by honoring its heritage of seeing things a little differently, loving people who want to change the world for the better and basically celebrating the spirit of rebellion and originality in basketball, Rock & Roll and anywhere else you find it. And there you have it, the history of Converse – for now… The best stories are the ones that don’t end. The ones you just keep adding to and adding to, all the while marveling at the creative, disruptive, optimistic, courageous ways things evolve from being what they were, to what they are, to what they will become. 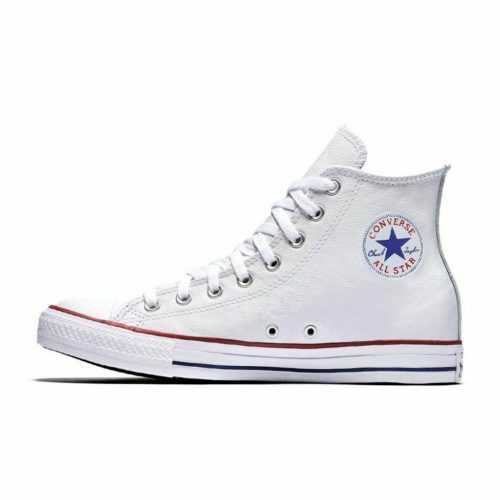 CONVERSE ALL STAR BASIC LEATHER HI WHITE.